Workout Routine for men that involves exercises with and without weights to increase your muscle mass (hypertrophy), gain absolute strength and muscle endurance. This workout routine can be performed almost every day as long as you can apply good habits of life in terms of nutrition, good hours and quality of sleep, etc. This daily workout has a special focus on the muscles of the shoulders (deltoids) and the arms (biceps brachii, triceps brachii, brachialis, coracobrachialis, extensors and flexors of the forearms). You can get bigger legs too by applying this workout. READ: How drinking alcohol can affect your muscles. Exercise 1. Bench press with barbell or dumbbell, without inclination (bench parallel to the floor). Some people often present discomfort when doing this exercise with a barbell, or other people usually have a strenght imbalance on one of their sides, which the barbell usually inclines to one side during the execution of both the concentric and eccentric phase of this exercise. If either of these things happens to you or if the barbell bench press is too "busy", then you can choose to do it with dumbbells on another bench. You should be careful not to exaggerate in the downhill (eccentric phase) to avoid compromising too much the glenohumeral joints of each shoulder-arm. You do not need to do a very exaggerated opening or stretch your arms fully when opening, to prevent the shoulder and elbow joints from suffering too much to avoid injury. Focus on tightening well without bumping the dumbbells. Do not exaggerate by carrying the dumbbell too far behind your head. Also do not lower the dumbbell when you have it over your chest since this exercise is not to exercise the triceps directly. Focus on the pecs. When you have the dumbbell above your chest, instead of approaching it towards your chest, try to do a scapular protraction ... or as trying to keep it farther by keeping your arms straight. READ: why sometimes is so necessary to drink protein shakes to gain more muscle? Exercise 4. Crosses with chest pulleys. Here in addition to working the pectorals, the anterior fibers of the deltoids also suffer some degree of stimulation but not a very pronounced. Keep in mind when raising and closing, tighten very well. In the descent (eccentric phase) do not let yourself be defeated by the pulleys but try to do a phase of controlled movement and relatively slow. Exercise 5. Chest press incline ("Hammer"). Not all gyms have this type of machine which is used for working out with disks or pulleys. If there is one in your gym is an excellent complement. You can work unilaterally and / or bilaterally, that is by doing the repetitions first with one side of your body, and then with the other, while the other side maintains an isometric / sustained contraction to further stimulate muscular endurance. Exercise 6. Prone arm push-ups. You can make each series until failure. Exercise 7. Stand arms Extension for triceps with pulley. You can try to raise the pulley further so that the 90 ° angle that forms between the arm and the forearm "breaks", generating a smaller angle and thus allow the range of motion to be wider to stimulate a greater number of muscle fibers. However, if you notice that doing this causes pain in your wrists or elbows, then you can either try a different grip barbell as shown to the left or let the pulley go only until the angle of 90 degrees is formed. READ: Ways to increase human growth hormone naturally. Exercise 8. Press california with barbell in "W" or normal barbell depending on how you feel most comfortable. Exercise 9. Pull over arm extension, standing, with pulley. If the pulley is not available then you can do it with barbell or dumbbell. Exercise 10. Triceps kickback (incline arm extension) with dumbbells. 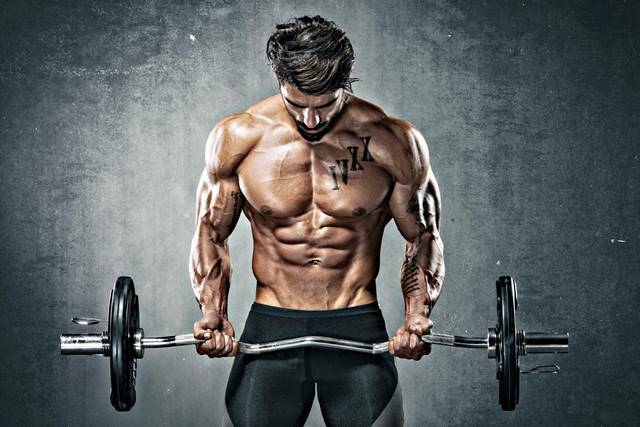 READ: Best exercises to get bigger arms. Exercise 1. Free squat with barbell on the trapezius muscle. If you notice that your back and / or knees suffer too much, then you can try it on smith machine (although I always consider it better free with bar because helping to maintain balance stimulates more muscle fibers) or hack machine. Exercise 2. Deadlift with barbell. The grip may vary according to the weight handled. If you hold a palm-facing grip on one arm, and a hand-held grip facing the back of your other arm, you usually tend to lift more weight. Remember not to hustle at any time to avoid injury. Exercise 3. Inclined leg press or not inclined leg press with pulley (you can perform one in a training session and the other variant in another training session). Exercise 4. Flexion for biceps femoris, lying down. Exercise 5. Frontal displacements also known as frontal Lunges. You can do them without any displacement (not walking) or if you have more level then you can move as such forward. Backwards you can also move but you must be much more careful. Exercise 6. Side lunges with barbell on the trapezius or seated adductor muscle mahcine. It depends on your level, the availability of the machines and how you feel, you can choose one or another exercise to work more closely your adductors. Of course other leg muscles and gluteal area are also stimulated. Exercise 7. Standing calf raises on smith machine or there are also specific machines for this purpose to exercise the triceps sural, as shown in the following image. Avoids bouncing when performing each movement very quickly. Try to go down completely and climb/raise as high as you can. Let the movement be controlled and not too fast or "crazy". Exercise 8. Seated calf exercise. Exercise 1. Military press with barbell or dumbbells, sitting or standing. If you do not have "unevenness" of strenght (or one arm stronger than the other), you can try to do with bar. And if you consider that you have a good level, good strength in your core area, legs and buttocks, you can venture to do it standing. Depending on your level, general strength (especially in your core region, glutes and legs), you can do it sitting or standing. Do not exaggerate by raising the dumbells more than the image shows, since the objective is to stimulate mainly the lateral fibers of the deltoids. In addition, when you use a lot of weight, raising too much can over strain and increase the risk of injury to these joints. Exercise 3. Front elevations/raises with dumbbells. Do not exaggerate raising the dumbbells too much, much less when handling very high weights. Avoid excessive and unnecessary compromising of these joints. Make sure the grip is comfortable, without generating excess tension in the wrists. The point is to stimulate mainly the trapezius muscle and the deltoids, and not that the joints suffer more than usual. Exercise 5. Scapular retractions with disks or dumbbells, with scapular retraction. If you look well, when you raise / retract then you must retract the shoulder blades, or "throw" them back as far as you can. Exercise 6. Biceps curl with barbell, standing. The grip can vary depending on how you feel (prevent the wrists from suffering more). Exercise 7. Preacher sitting, with barbell or pulley. It depends on availability. You can also vary, one day you do with barbell and another day on pulley. Exercise 8. Biceps curl with pronation grip. You can do it with barbell or pulleys, standing or sitting. You can vary every day. Exercise 9. Flexion and extension of forearms in pronation. Exercise 10. Flexion and extension of forearms with supine grip, with barbell or dumbbell. Exercise 1. Seated rowing pulley. Exercise 2. Lat pull towards the chest. Exercise 3. Pull over on pulley for back stimulation. Exercise 4. Standing Row with barbell. Notwithstanding the above, the routine can be modified to train fewer days a week since it is scheduled for Day 1, Day 2 ... and so on Day 6. Then if for example on Monday you trained on Day 1 and the Tuesday you could not train for any reason, then on Wednesday you return to train applying exercises of Day 2. And so, that the order of Days (1, 2, 3 ... 6) is followed in order and can give to workout the day of the week (Monday, Tuesday ... Sunday) that you can. It is a matter of combining resistance workouts with series of equal numbers of repetitions with loads of between 60% and 70% of your RM, with series in ascending and / or descending pyramid, and series focused on the absolute force gain applying series of on average 8 repetitions each, handling weights of about 85% to 85% of your RM. NOTE: Although this training routine is stablished for men, women could also apply it. 1. What is RM or 1RM and how to calculate it? The RM ("One-Rep-Max or Maximum Repetition") value simply indicates the weight which you were able to perform a single repetition in a certain exercise. It can be calculated using formulas using less weight (it is used more in people with less experience), or it can simply be calculated in a direct way by weighing high weights (usually this second option is used for more experienced people). NOTE: You can use the first few days to perform these RM calculations for each exercise proposed later in this exercise workout routine. PERFORMING less than 10 REPETITIONS 1RM = weight lifted / (1.0278 - (0.0278 x No. of reps) (Brzycki formula). 1RM = 70 / (1.0278 - (0.0278 x 6)) = 81.3 which could approach 81 kg or 80 kg (depending on the disks at the gym). 2. Variation of the exercises by applying another system each week. Exercises that were used to work absolute force (series of 8 repetitions with weights between 80% and 85% of the RM) in the first week, next week should be used to work sets of 15 repetitions (with weights between 60% and 70% of the RM) or pyramidal series (weights between 60% and 85% of the RM). 3. Order to apply the exercises. First, begin with resistance exercises (series of 15 repetitions), then continue with absolute strength exercises (series of 8 repetitions) and then end up with exercises in ascending or descending pyramid (begin, for example, the first series with 18 repetitions, the second with 15 repetitions, the third with 12 repetitions and the last with 8 or 10 repetitions, of course gradually increasing weights in each repetition) to combine all variables (strength, endurance, hypertrophy). 4. Number of sets to be performed. This depends on how long you can devote to your workouts. It is recommended that you do a maximum of 4 sets per exercise and a minimum of 2. This applies to all exercises. Warm up on treadmill, elliptical or ergometric bike for about 5 to 10 minutes before starting each workout. If you are going to use the treadmill, try to ensure that the speed is not too high (between 8 and 9 km / h) with a maximum incline rating of 3%. Stretch only at the end of the whole session after 10 minutes of having finished everything (when you are calm again). Do not stretch during breaks between exercise sets because it reduces work capacity and may increase the risk of injury (just do it in case of muscle cramping). You can drink water, although it is ideal to take a hypotonic or isotonic drink either that you buy it or that you take it prepared from home, since maintaining a good balance between sodium and potassium is crucial for allowing good muscle contractions and at the same time avoiding muscle cramps. 8. The training of core muscles. Both the abdominal and back muscles (or also called lumbar) should be stimulated either at the end or at the beginning (after heating) of your training routine. If you train them at the beginning will be good because you me sure to strengthen them to face your training routine, although you could also end up exhausted to perform the rest of your routine exercises, so try either one way or another and depending on feel when doing it at first compared to apply them at the end of the training routine (before stretching). You can apply a working system with each sets executed to failure. You can also apply exercises with weights like for example the crunches in pulley. All this depends on your goals in this area. 2. If this week you did Chest-triceps, shoulder-biceps and back-triceps, then the following week do Chest-biceps, shoulder-triceps and back-biceps. 3. You can apply more or less exercises depending on the time and how you feel. For example you can apply only 1 of each form of training, that is one of a series of 15 repetitions, one for absolute strenght (series of 8 repetitions) and one of pyramidal form. If you have a lot of time you can apply 2 exercises for each form of training. 4. Breaks between sets may vary according to your level and how you feel. For example for the series of 15 repetitions you can rest in average 60 seconds. For strenght series (repetitions of 8) you can rest for an average of 2 minutes. For pyramidal series the rest may increase as weights increase. 6. If you can only train 3 days a week, try to do it on separate days, ie Monday, Wednesday and Friday. It is not recommended to train 3 days in a row and rest 4 days in a row since during this time physiological maladjustments can occur that can lead to some injury when the workouts are returned and resumed with the same intensity. 7. If you can only train 3 days a week, in addition to following the previous recommendation, try to perform full body routines by choosing 2 exercises for the workout of each muscle group. I usually recommend starting with working out the legs, but this really lies in everyone.